The air-conditioning system in your space plays a very important role. It does not just provide cool air but it also gives you an overall comfort, especially on the scorching summer season. However, it is understood that there are potential risks that may happen in the future, particularly when the system works 24 hours a day, 7 days a week. Once you happen to observe its malfunction, then you need to call for an AC repair service to ensure its total functionality again. Why Need a Professional Service? When you notice some issues in your AC system at home, you might consider calling for a professional service. This wise decision will allow you to save money by increasing your systems efficiency and preventing its breakdowns. DR Appliance holds the most appropriate knowledge and skills to help address your AC system issues away. From the beginning of the job to the end, we ensure safety from the equipment, which has already been a part of our core service. Furthermore, we understand that your AC system must maintain its coolness in summer – without a higher utility bill. DR Appliance will make sure that the amount of temperature inside your respective home is just right. We will offer you with AC repair, as well as AC maintenance if needed. As a professional, we will ensure that your AC system will run smoothly all year long. Why settle for less if you can have more than what you expect. DR Appliance – your gateway to cutting-edge standardized AC repair service. 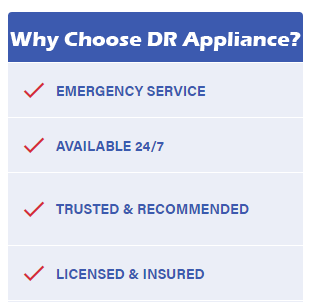 DR Appliance strives to give you the utmost quality over the service done. We also do our very best to provide you with a helpful information, so you will understand your own AC system, and learn what to do to keep it well, while it operates as efficiently as possible. Keeping your home comfort is our major goal why we extend quality service at the most competitive price points. For so many years, we have been helping numerous homeowners and building owners in both commercial and residential spaces across the local for their AC repair needs. We are glad to extend efforts to supply people with luxury living as their AC system functions well. We do every job with high confidence and honest service. If your AC system parts call for a replacement, then we will immediately tell you. We will also offer you with service availability, which means if you are going to have an emergency appointment, we are available at your most convenient time. We also offer same day or next day service appointment under your request. When it comes to payment options, we are offering flexibility to suit the service at the described budget. Set your appointment. Call DR Appliance for your AC repair needs today.